Today, when you order "Balloon Magic Made Easy by Royal Magic", you'll instantly be emailed a Penguin Magic gift certificate. You can spend it on anything you like at Penguin, just like cash. Just complete your order as normal, and within seconds you'll get an email with your gift certificate. 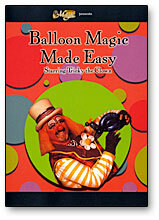 Balloon Magic Made Easy by Royal Magic (DVD) This broadcast quality DVD teaches you how to make incredible creations like a professional balloon artist in just minutes. You will learn some basic creations and balloon handling from this work. There are however better resouces available from Penguin that your money would be better invested in. If you are only looking to ever make a few items with balloons this would be a good resource. But when a kid asks for something more complex you will be lost. If you want to add to your shows or just twist balloons for your childs birthday party. The clown makes it easy to learn. Step by step and your on your way. Good balloon shapes Animals to flowers and even planes. I have upped my bookings, this DVD has paid for it self over and over. Many children birthday partys have very young kids and they are lost with some magic tricks, the balloons can bridge the gap including these children in the show. This DVD makes balloon animals a breeze. I picked it up and right away I was making balloon animals that were professional looking. Thanks again Penguin! !